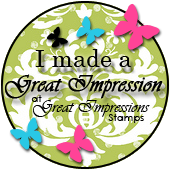 Stamping with a Passion! 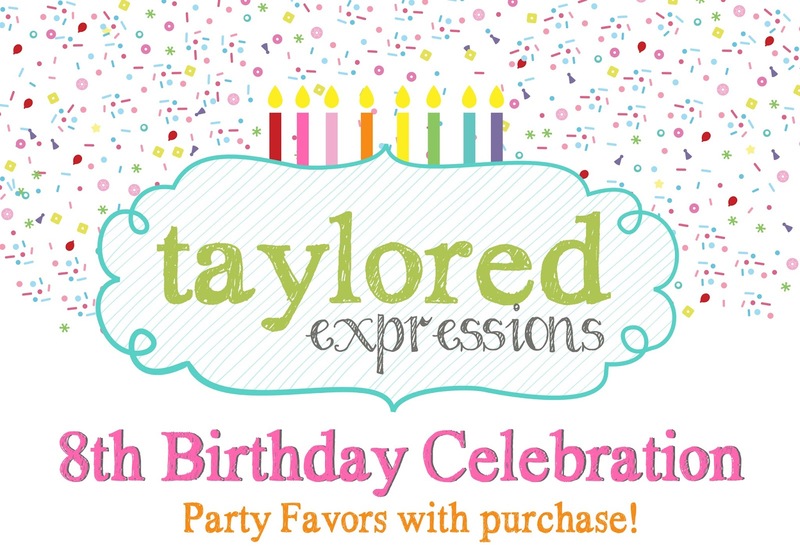 : Taylored Expressions September Sneak Peeks: Fall is in the Air!! 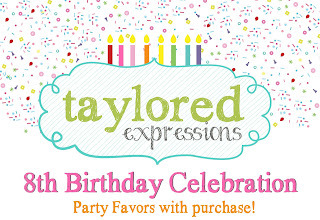 Taylored Expressions September Sneak Peeks: Fall is in the Air!! My first card features the Thanks Cutting Plate...it was cut out of TE Premium Watercolor Paper and colored with Zig Clean Color Real Brush watercolor markers. When dry, it was adhered to the Buttercream Frosting background and then adhered to the Plum Punch cardbase. Pearls were added as the finishing touch. My second card features the adorable Little Bits - Fall Harvest dies and the sweet little On the Road - Wagon dies. 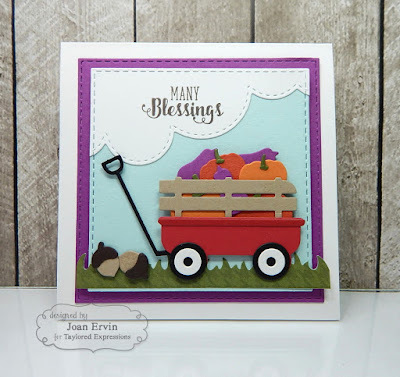 This was such a fun little fall scene to create...the little red wagon looks just like the one I used to have when my Grands were small!! The wagon and the harvest pieces were all cutout of lots of different TE cardstock, glued together, and popped up on the Salt Water Taffy background that was cut out with the previously released Stitched Square Stacklets. The previously released Grass Border was used to cut out the grass from Playful Patterns - Harvest 6x6 paper pack paper and to finish it off, the sentiment from the Pumpkin Bouquet stamp set (sneak peeks tomorrow) was stamped with Chocolate Truffle ink on the cloud cut with the previously released Build a Scene - Rolling Clouds die. 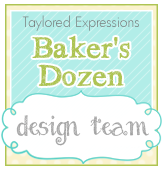 Thanks for stopping by today...If you would like to see more projects and new product info, please head on over to the TE Blog for a complete list of our participating designers!! Remember...the September Release is Thursday, September 1 at 7:00 AM PST (9:00 CST). 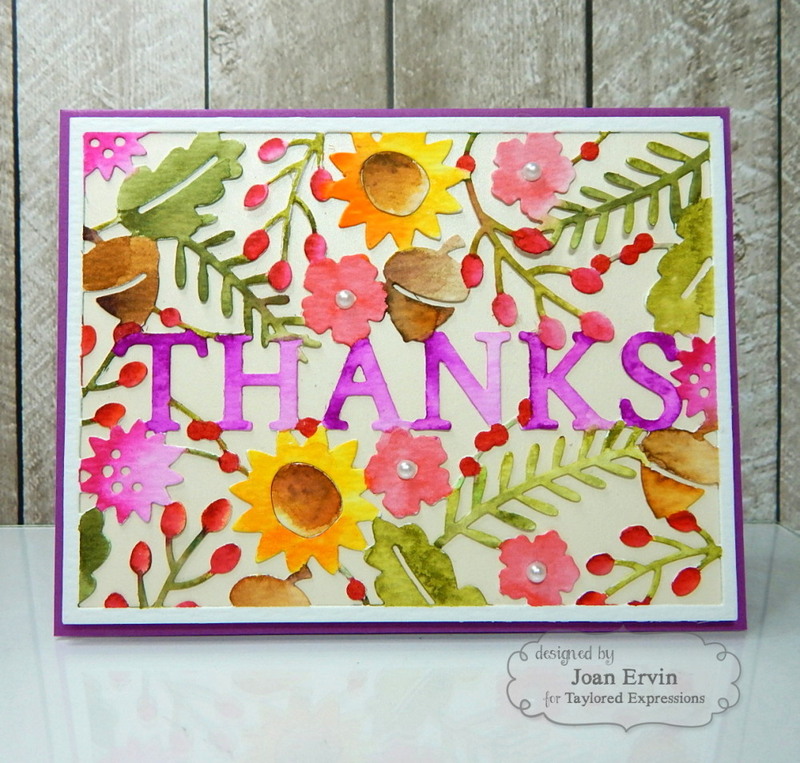 I love the coloring on the Thanks cutting plate card! I just realized that the stamp set Fall Florals has some of the same flowers, great to order together. The watercoloring is so soft and pretty. Love your cards Joan! 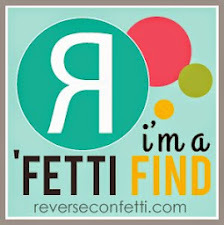 For a second there, I thought I was at my blog! 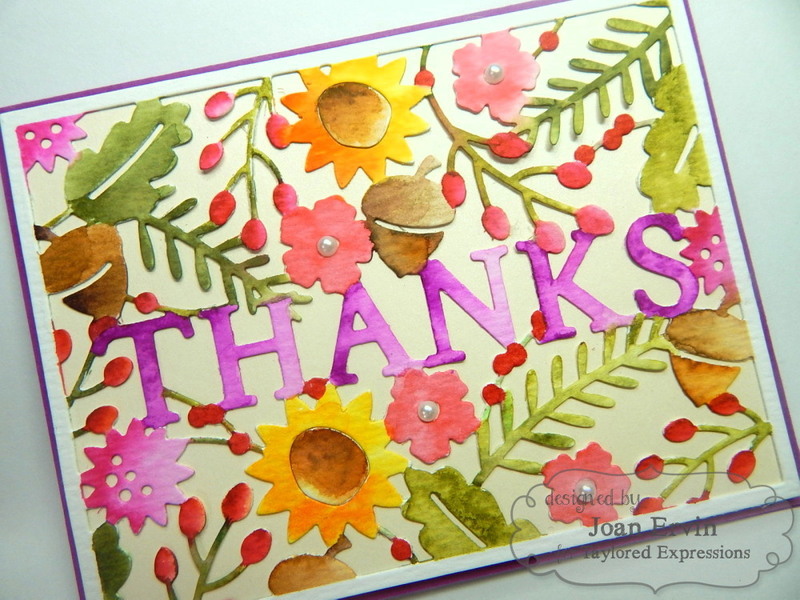 hehe I love the Thanks cutting plate watercolored. 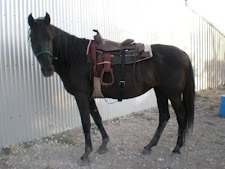 Still thinking of other ways to do it up. So cool! I didn't get the wagon but I love your card...tempted! lol So cute! 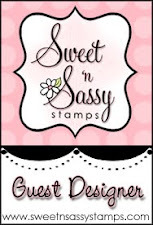 Fabulous cards... I'm loving that little wagon! 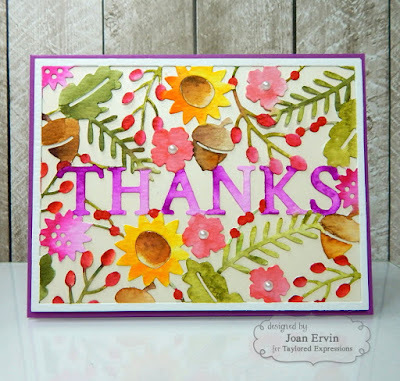 Love how you used the Thanks cutting plate on the watercolor paper. Fabulous colors on that one. 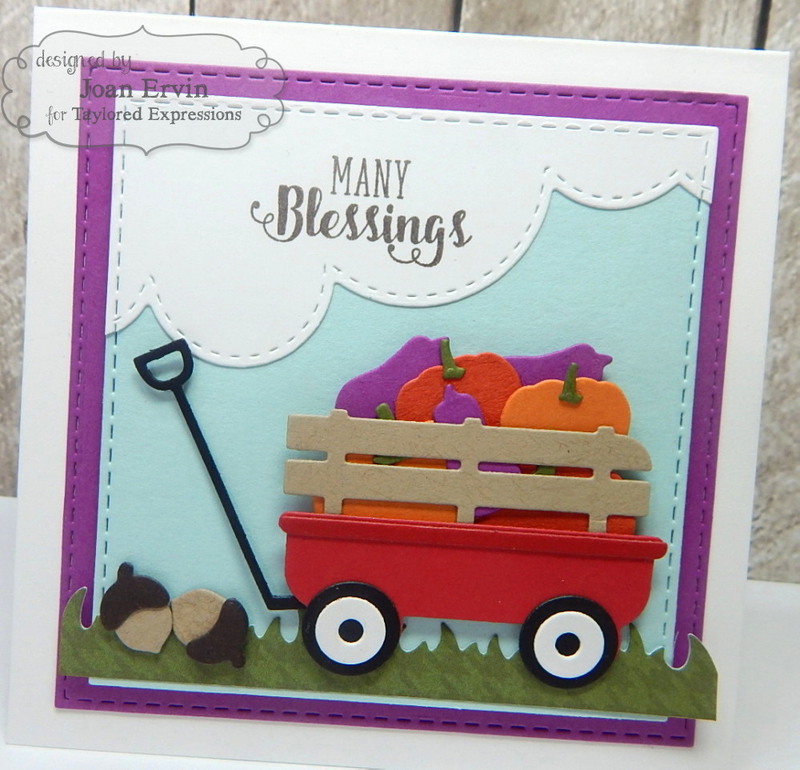 That little wagon is becoming a must have, and I like the different colors of card stock you used pumpkins. Wonderful cards!